Very loose-fitting shirt has collar, bands (collar, front, back and sleeve), no shoulder seams, yoke front and back cut-in-one with sleeve, undersleeve, sleeve flounce, side slits, flat-fell seams, and narrow hems. Sleeve, front and back bands extend into tie ends. Back and lower front and back bands are applied. Loose-fitting, wide-legged, lined pants have self-drawstring waist, back extending to side front, no side seams, side front pockets, fly zipper, self-bias binding finishing waist facing and fly, and stitched hems. Both have topstitching. MISSES'/MISSES' PETITE DRESS: Lined dress (close-fitting through bust and fitted through hips) has neck band, seam detail, pleated flounce, bias armhole band and invisible back zipper. FABRICS: Sateen, Crepe, Lightweight Twill. Contrast: Two-way Knits, Rayon/Spandex, Cotton/Spandex. Guy Laroche Jacket & Skirt. Semi-fitted, partially interfaced, lined, above-hip jacket has collar, cut-in shoulders, shoulder pads, welt pockets, side panels, no side seams and long, two-piece sleeves. Slightly flared or flared skirt, mid-knee or floor-length, has contour waist and back zipper. B: back extends into train. FABRICS: Novelty Satin, Satin Back Crepe and Brocade. Size 14-20 only Flared skirt, below mid-knee has lined yoke and side zipper closure. 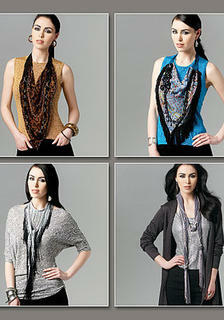 NECKWEAR: Scarf A: Approximately 90" Long, purchased beads, ribbon and chain. Scarf B: 63" Long, purchased fringe. Scarf C: purchased beads, ribbon and chain. Scarf D: purchased fringe and applique. Only size 16 - 24 available Fitted blouse or tunic has front tucks/button band, shaped hemline, and narrow hem. A,B,C: bias neck binding extends into tie ends, flounces (wrong side show), with unfinished hem. A and D: stitched hem on sleeves. E and F: pleated sleeves. B,C,E,F: seam opening on sleeves with button cuff, thread loop (B,C). D,E,F: collar band, D,F(collar). FABRICS: Charmeuse, Crepe de Chine, Chiffon. MISSES' JACKET, BELT, TOP, DRESS, SKIRT AND PANTS: Loose-fitting, lined jacket has collar, shoulder pads, waist tucks, welts, self-lined flounce, sleeves with stitched hem and belt. Fitted, pullover top or dress has raised neckline extending into back collar, yoke/back sleeve cut in one, back neck slit and hook & eye closure. C: back hemline slit. Semi-fitted skirt has seam detail. Loose-fitting, wide-legged pants have side pockets. B,C,E: stitched hems. D,E: back zipper. FABRICS: A,D,E: Lightweight Woolens, Gabardine and Crepe. B,C: For Two-Way Stretch Knits such as Rayon/Spandex and Cotton/Spandex. BAGS: Owl Bag A: 6 1/2"W. x 9"H. x 5"D.; contrast straps, bands and owl applique. Frog Bag B: 7"W. x 10"H. x 8"D.; front pocket and contrast belly, chin, straps and bands. Both views are lined. Measurements are approximate and exclude straps. MISSES'/MISSES' PETITE TOP: Loose-fitting pullover top has elasticized, seamed waist, bias lower front and back, and narrow hem. A: sleeves with stitched hem. B and C: lined, collared, collar band, back neck slit, and hook & eye. FABRICS: Broadcloth, Crepe Back Satin, Linen, Light-Weight Denim. MISSES' SKIRT: Pleated skirt has raised waist and side zipper. B: hem band. FABRICS: Wool Jersey, Stretch Wovens, Crepe, Linen Blends. MISSES' VEST, SKIRT AND PANTS: Lined vest has collar, self-lined upper front, side pockets and topstitching. Skirt and straight-legged pants have elasticized waist and stitched hems. A, B, C and D: semi-fitted. FABRICS: Crepe, Gabardine, Ponte Knit, Lt.Wt. Denim. MISSES' COAT AND BELT: Very loose-fitting, wrap coat has front extending into pleated hood, side front seams, pockets, carriers and belt. Topstitching. A: reversible. B and C: lined, and self-lined front and hood. Combinations: Y(XSmall-Small-Medium), ZZ(Large-XLarge-XXLarge) FABRICS: Lightweight Woolens, Fleece, Gabardine. Also for Contrast A: Satin, Taffeta. MISSES' JUMPSUIT AND BELT: Lined jumpsuit or romper has shoulder pads, fitted bodice, French seams, straight-legged or tapered pants (semi-fitted through hips), side pockets and invisible back zipper. A and bodice/sleeves B: Cut on crosswise grain. A, B: Surplice bodice, and bias back neck facing. A: Short sleeves. B, C: Long sleeves, belt and thread loops. 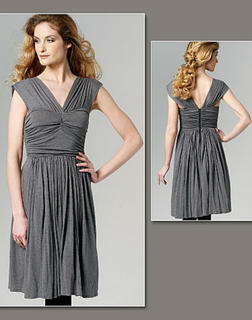 C: Contrast bodice and scoop neckline. FABRICS: A, Contrast B: Double-Edge Scallop Lace. B, C: Crepe-Back Satin, Georgette, Burnout Velvet. *With Nap. **Without Nap. Unsuitable for obvious diagonals. NOTIONS: One Pair of 1/2" Covered Shoulder Pads, 22" Invisible Zipper and Hook & Eye. MISSES' SHAWL OR NOTCH COLLAR COATS WITH BLANKET STITCHING Very loose-fitting wrap coat has blanket-stitching, snap closure, and length and collar variations. A, B: Self-fringe at hem, shawl collar and pocket. C: Notched collar. FABRICS: Loose Weave Wools, Silk Tweeds. Unsuitable for obvious diagonals. NOTIONS: A, B, C: Two Large Snaps and One Ball Yarn.